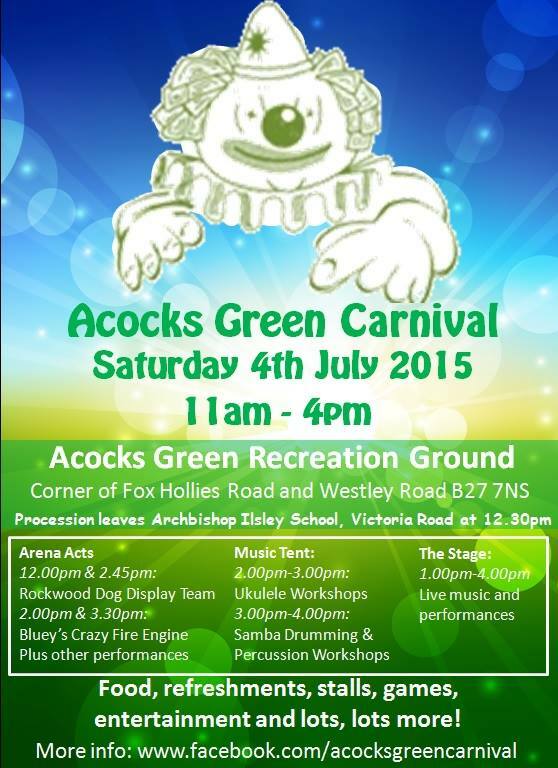 Acocks Green Neighbourhood Forum will be represented at this year’s Carnival with a stall selling a variety of plants, some unusual ones too – from herbs and chilli peppers to colourful annuals, all at bargain prices, not the usual garden centre rates. There will be LOTS of stalls from local organisations selling a variety of bric-a-brac, treats and much more. Come along and support your local community and find out about some of the local groups in the area and enjoy the entertainment. This entry was posted in Events and tagged Acocks Green Carnival, Acocks Green Neighbourhood Forum, drumming, entertainment, food, music workshops, Procession, Rockwood Dog Dislay Team, stalls. Bookmark the permalink.